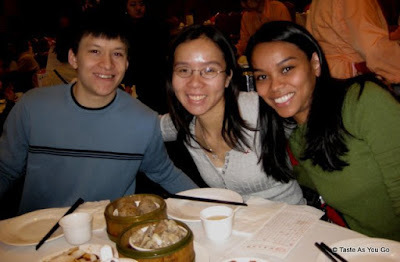 Last Sunday, I met up with some friends (Linda and Matt) at Jing Fong Restaurant in New York's Chinatown for dim sum after months of failed attempts at making it happen. I scarcely had time to take off my coat and set my purse on the floor when Matt asked, "Do you like chicken feet?" It was a question I wasn't anticipating. Before I could answer, Linda said, "I won't eat them." After pausing to ponder the question, I finally answered, "I don't think chicken feet should be the first thing I eat on a Sunday morning." I had never been to Jing Fong before, so I didn't really know what to expect when we rode the escalator from the ground floor to the second floor. When we entered the main room, which was full of large round tables, we were escorted to a table in the back. I had to take a second to take it all in. Organized chaos! Eventually, two other parties of diners joined us at our table to fill up the empty seats. Rather than wait for the servers to push the food carts past our table, Matt grabbed our bill (so it could be stamped) and took the initiative to hunt down some dishes for us. First up? Some rice noodles stuffed with shrimp (Linda, Matt, correct me if I'm wrong!). So delicious! While Linda and I worked on those, Matt left the table again and came back with more goodies. This time? Steamed pork spare ribs with taro and steamed pork meatballs. I could barely keep up with Matt's speedy delivery! I'm so glad I went to this place with people who knew what they were doing. Without Linda and Matt, I would be totally lost and eating things completely unidentifiable to my eyes. Up next? 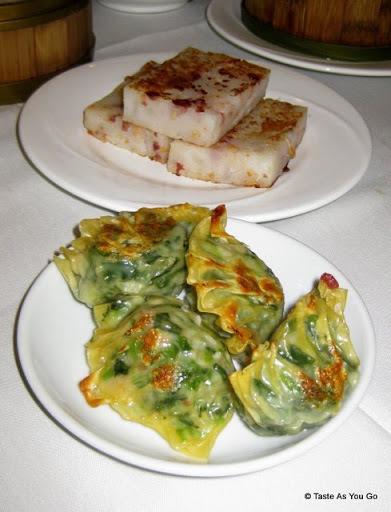 Rice cakes with flecks of Chinese ham and taro root and fried dumplings stuffed with vegetables. I wasn't a huge fan of the rice cake, even after smothering it with hoisin sauce. I heard Linda say the word "cake," and I expected something sweeter. Even though she told me there was ham in it, I couldn't get over the fact that it was a savory dish. Oh well, I can't like everything! Just when I thought I couldn't eat any more, Matt brought back one more round of food: steamed shrimp dumplings (upper left), chicken feet (upper right), and Japanese eggplant stuffed with shrimp. Matt hadn't forgotten about the chicken feet, and I couldn't forget about them either. They were right in front of me, challenging me... calling me chicken... So, I went for it, and Linda made sure to capture the moment. There you have it, folks -- documented proof that I tried and ate a chicken foot. Did I like it? Let's just say I didn't eat the whole foot! But I did enjoy the meal we ate at Jing Fong as a whole. For the three of us, all of that food -- including the Chinese broccoli I didn't take a picture of and the tea we drank -- cost just under $35! An incredible deal, if you ask me!! Since we didn't eat dessert at Jing Fong, we stopped by the Chinatown Ice Cream Factory for something sweet. It was hard for me to decide which flavor to try since so many of the flavors sounded great, but I finally settled on a dish of Almond Cookie. Yum!! It was just what I needed to help me forget that I put a chicken foot in my mouth and the perfect ending to our lunch in Chinatown. I can't wait to go back! Ooh!! I had to try those a little while ago while out with friends (at a dim sum place here). I wonder if people actually have them often or if it's a delicacy. ...on that note: have you had duck beaks? or fried intestines? I recommend the duck...avoid the intestines if possible. Trust me. Angie - How did you like the chicken feet? I'm not sure how often people eat chicken feet (or goose feet or whatever), but I know won't be eating them again any time soon! well, i was told that we only eat whatever little soft tissue is in the foot. They were boiled or steamed (rather than fried) so it was a little weird to me. The beaks actually had a little bit more "meat" on them compared to the feet. They weren't amazing, but if I had the choice I'd rather go with the beaks. Since grandma no longer cooks, if i ever get to eat intestine, it's going to be in Lyon. Are you coming to Philly soon? We should go do Dim Sum! Angie - Yeah, the fried soft tissue did not feel pleasant in my mouth when I tried it. I thought, maybe, sucking the fried part would work, like you would the marrow off a bone, but I nearly inhaled the whole thing by doing that! Not sure when I'll be in Philly next, but I'll keep you posted! I'm down for some dim sum action!! Love it! Dim sum is so much fun! :D Fabulous pics! Gail - Ooh! I'll have to try the pumpkin ice cream the next time I go! Thanks for the recommendation!! paoix - I'm really glad we stopped by the Chinatown Ice Cream Factory for a post-lunch treat. I was stuffed from all the dim sum, but the ice cream was worth it. I'm tempted to order a cake from them one day. Have you ever had their cakes? Jing Fong's is great for dim sum. We went a couple of year's ago, but didn't have the name correct. My husband kept asking people on the street if they had heard of Jimmy Fong's...we finally found it and it was delightful. Fred tried chicken feet, but I took a pass. Good for you for giving it a go. Nice work Michelle. Not exactly 24 dishes but then again you didn't have 3 other people with you eating so I can't hold it against you. Have you had other dim sum before? Is this your go to place? Where will you try next? We should share links, I posted your site's link on my blog roll and would be honored if you did the same. This was the first time I've had dim sum served like this. I had a great time and thought the food was good, so I'll definitely be back... It's too early to say whether it's my go-to place, though. My friend Linda, who invited me to Jing Fong, has been wanting me to go for dim sum with her in Flushing, so I suppose that's where I'll try next. Ah! I went here once (unfortunately with an ex) and never could remember the name! Have always wanted to go back. Glad you had a good time! myblissfulbites - I'm glad this post helped you remember the name of the restaurant! Now you'll be able to go back and stuff yourself full of delicious food again. Come to think of it, I should plan a return trip in the near future. I could use some dim sum!